Biology Chapter 7, 8 & 9 Summary of Chapters 7, 8 & 9 of the book campbell biology a global approach. Celbiologie This document contains a summary of the subject cell biology from year 1 of Biology and Medical Laboratory Research Avans. This summary is in English. H10 Campbell; Cell respiration. Summary of Chapter 10 of Biology; A global approach. In this chapter, we discuss the dissimilatie- either verbranding- in the cell. A wide range of topics will be discussed such as; glycolysis, pyrodruivenzuuroxidering, citroenzuurcylus and oxidative phosphorylation. 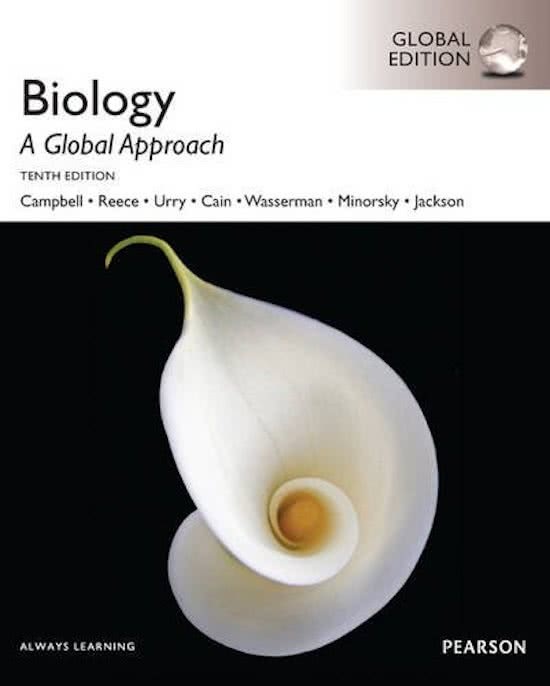 H6 Campbell; Energy and life Summary of Chapter 6 from Campbell Biology; A global approach. Chapter 6 deals with energy and life. It explains Gibb's free energy, enzymes (and their inihibitoren / stimulators) and many other issues concerning energy in organisms. Diversity of Life Term 1 notes - Evolution, Early life forms and Invertebrate Metazoa Summary of lecture notes from the Diversity of Life module. Notes include the topics Evolution, Early Life Forms and Invertebrate Metazoa. Notes are very clear and contain colourful images and diagrams. Excretion and the human kidney How do you excrete toxins and drugs from your body? The human excretory system! These are lecture notes about the human excretory system which include the kidneys and the bladder. This course is the second Biology course for undergraduate education but could also be applied in other classes as well. Auf dieser Seite findest du Zusammenfassungen, Mitschriebe, Arbeitshilfen und vieles mehr für das Lehrbuch Biology: A Global Approach Global Edition. Die Zusammenfassungen wurden von Studenten persönlich geschrieben, was dir wiederum einen Einblick darin ermöglicht, was beim Studium dieses Buches besonders wichtig ist. Themen wie campbell, biologie, samenvatting, celbiologie, summary, HAN, campbell biology a global approach & hoofstuk werden behandelt.